Today we present you with Summoners War an RPG this might rather inspire at first sight casual gamers, but probably also has to offer one or the other element for long time players. Available is the adventure for Android, iPhone and iPad. In the world of Summoners War you are a talented summoner: in the arena together with your monsters you should earn great fame. This long-term goal firmly in mind you start the adventure on your personal sky island. Here you can summon new monster, upgrade your favorites and build your defense against other Summoners. From here, you reach over the map also the arena itself. Here you can compete against computer-controlled rivals or duel against other players of your level. Before each battle you choose, with a view to the preparation of the enemy, the monsters that should fight for you, and off you go. Using the touchscreen you select each one of the skills of your own monster and then determines an opponent’s aim. The fighting itself is turn-based and strongly reminiscent of the famous from the Final Fantasy battle system. In addition to the battles the focus of this game, is also on the gathering and training of countless monsters. These are divided not only by stars in single stages, but also in different elements. Each of these five attributes so therefore has specific strengths and weaknesses. For example, fire wind, beats water but water alone is strong against fire. Monster are obtained by summoning them from the different scrolls. Depending on the value of the role, a higher-level random monsters will appear. Next you can specify this companions thus obtained by the engraving of runes. This may vary depending on combination, the specific strengths of a monster nor increase or compensate for its weaknesses. It is also possible to awaken monsters. This requires a whole range of different essences, which are in short supply in various dungeons. The search, however, is worthwhile: The awakening creates a completely new, unique monster with higher values and new skills. Summoners War is a free app, but is very extensive. The history offers many new places to explore and beat many challenging boss fights. In addition, there are other dungeons, where you can train your monsters. These are even involved in the quests and after successful completion, offer great rewards. From daily missions to those that are linked to the act itself, the game lets nothing to be desired. There is seemingly always something to do. Also a rankings system works for the arena. So you always fight towards players that are about on the same level and so are equal opponents. It is possible to acquire through in-app purchases summoner packages or crystals, but not exclusive items that would not be possible without the investment of real money. With sufficient patience in the appropriate places, the free game is also therefore a great pleasure. Summoners War is available in the Google Play Store as a free download. The required Android version for this is 2.3 or higher. The game is also available for free on the iTunes App Store and needs at least iOS 6 or higher. It is compatible with iPhone, iPad and iPod touch. 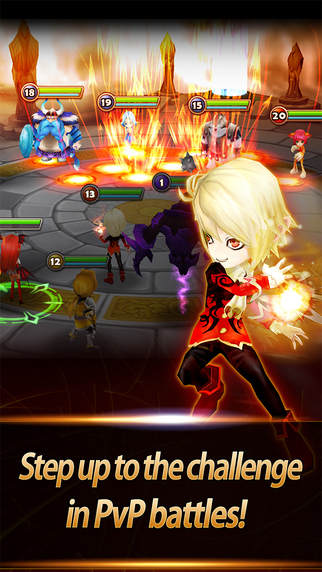 Be the first to comment on "Summoners War: Thrilling RPG for Android, iPhone and iPad"